Looking to target the high end premium headphones market, Sony announces the Sony MDR-1 Series of Headphones. They range from noise cancelling to ones featuring NFC with Bluetooth technology that you can sync to your Xperia device or one device featuring such compatibility. That is one thing about Sony, they sure do create some of the best looking devices on the market ranging from its TVs down to its headphones. Read more about the MDR-1 Series of Headphones at the presser following. 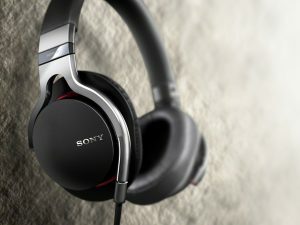 SAN DIEGO, August 29, 2012 – Today Sony introduced its new premium headband-type MDR-1 headphones. Available in standard, Bluetooth wireless and digital noise canceling versions, the new MDR-1 headphones is a result of a unique collaboration between Sony Electronics and Sony Music Entertainment. Combining Sony Electronics’ expertise in superior sound quality, comfort, and beautiful design, with Sony Music’s knowledge of current music trends, the new MDR-1 premium headphones deliver an enhanced acoustic design allowing listeners to hear the music the way artists intended it to sound in the studio. Sony engineers and music artists identified the critical 30-40Hz sub-bass region that is signature of today’s music styles and developed an enhanced Beat Response Control design for the new MDR-1 headphones, featuring a closed back for maximum isolation and exceptional bass response. With enlarged air vents at the back of each driver, music lovers experience a quick and rhythmic low frequency response. Featuring a newly developed 40mm Liquid Crystal Polymer (LCP) film diaphragm, the MDR-1R delivers high rigidity, lightness and higher internal loss that is essential for a balanced, highly accurate reproduction of today’s up-front vocals, mid/high range details, as well as rich, powerful lows and extended highs. The high-definition driver assures ultra-wideband audio performance extending from 4Hz to 80kHz matching today’s high resolution music sources. The MDR-1R headphones are designed for long-term wearing comfort with pressure-relieving ear cushions, providing a supportive, wrap-around feel, as well as highly effective acoustic seal, further reinforcing the headphones’ powerful sub-bass reproduction. There’s also a unique hanger structure that moves the headphones’ housing axis inward for the ultimate in stable fit and comfort. The silicone rings between the ear cups and headband ensure rattle free enjoyment of the most detailed musical passages. Featuring grooved serrations on its surface, the MDR-1R headphones provide an innovative design that eliminates friction between cable surfaces and reduces the source of frustrating tangles. The MDR-1RBT Bluetooth headset brings the same innovative sound processing technologies to music lovers who demand the ultimate in sound quality without wires. It’s the first Bluetooth model to feature One Touch by Sony incorporating Near Field Communication (NFC) technology, eliminating the cumbersome process of pairing and connecting; just touch compatible devices to the headset to instantly establish a wireless connection without the need for any Bluetooth or Wi-Fi set-up. The headphones also offer up to 30 hours of battery life between charges. Because there are different types of noise, Sony’s Artificial Intelligence Noise Canceling technology automatically selects the appropriate noise canceling response based on intuitive analysis of ambient noise. Sony’s digital signal processing technology effectively reduces up to 99.7% of ambient noise whether on an airplane, on a train or in an office. The MDR-1RNC digital noise cancelling headphones include digital noise sensors inside and outside the headphone housing as well as a digital noise cancelling software engine. The MDR-1RNC digital noise cancelling headphone features extra-long battery life of up to 22 hours. The MDR-1R standard headphones, MDR-1RBT Bluetooth wireless headphones and MDR-1RNC digital noise canceling headphones will be available in November 2012 at Sony Stores, including online at http://store.sony.com, and other authorized retailers nationwide at the following pricing: MDR-1R, about $299, MDR-1RBT, $399 and MDR-1RNC, $499. For images and information, please visit www.sony.com/news.